You came to us a ball of fluff; you’re tail you carried high. It seemed you were aloof at first, but now we all know why. You were a special package, entrusted to our care, covered in a golden coat of long and flowing hair. Your eyes how they would twinkle, you had a special way of making us take notice of what you had to say. You loved to create mischief with your partner in crime; the two of you inseparable, together all the time. The two of you grew quickly, and with your special mate, would find wondrous things to roll in and then meet us at the gate. When Harley had to leave you, we know it took its toll, and broke your heart, as it did ours, when he was called to go. You stood your post, and did the most with everything you had, to make your family smile again although we still were sad. We all take love for granted, and hardly seem to care that one day special loves we’ve had, no longer will be there. You’ve had a rough time lately, and been tested by the best, but now it’s time to intervene and give you needed rest. Life is never long enough, but in our hearts we know, that better things await you so we have to let you go. We will kiss and hug you, and say our last good-bye to let you meet your partner making rainbows in the sky. 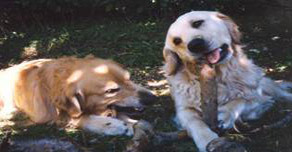 You two will chase the heavens and in the evening light, we’ll take comfort knowing that we shared in the delight, ofbeing in the presence of your never-ending love, sent back to us at sunrise, as glorious golden love. Gods Speed, Rest In Peace Mr. Pal!